Maiden Moor forms part of the western wall of Borrowdale, and is a familiar sight from Keswick, where it forms the high backdrop to Cat Bells. Maiden Moor is one of those fells that is rarely climbed in its own right, but instead as a stepping stone - in this case to High Spy, the highest summit on this ridge. The fell takes the form of a triangular wedge of high ground, with the narrow end connecting to High Spy, the north-western corner dropping down over Bull Crag and High Crags into the Newlands Valley and the north-eastern corner leading to Cat Bells. The western face is the most dramatic, lined with crags that overlook the middle reaches of the Newlands Valley. To the east the grassy slopes of Narrow Moor fall down to Borrowdale, with moth of the interest at the bottom approaching the village of Grange. The top of Maiden Moor is almost always reached along the ridge, either coming from Hause Gate and Cat Bells in the north or High Spy in the south. The western slopes are far too steep and craggy for the walker. On the eastern side Greenup is steep but possible, but also a rather dull walk. We have one walk that visits the summit of Maiden Moor, on its way from Cat Bells to High Spy and another that passes below the western crags while returning from Dale Head. The top of Maiden Moor is a gently sloping plateau that ends dramatically above the crags that overlook the Newlands Valley. The highest point on the fell is at the north-western corner of this plateau, near Bull Crag. The most obvious path actually misses the very top of the fell, but it is worth diverting to the western path, which visits the top and runs along the top of the crags. The western border of the fell is formed by Newlands Beck, which flows north below the western crags. The eastern border is formed by a series of smaller becks - Greenup Sikes form the boundary with High Spy on this flank, then turns north, becoming Ellers Beck further down. A series of nameless becks flow east into Ellers Beck from the slopes of Maiden Moor. Ellers Beck flows into the Derwent at Fitts Turnhole, so the fell has a short footing on the Derwent and on the south-western corner of Derwent Water. A nameless beck forms the north-eastern border, forming below Hause Gate and flowing into Derwent Water at Brandelhow Bay. Yewthwaite Gill forms the north-western border, running from Yewthwaite Combe straight into Newlands Beck. Depending on your dividing line either Far Broadgill or Near Broadgill marks the south-western boundary. 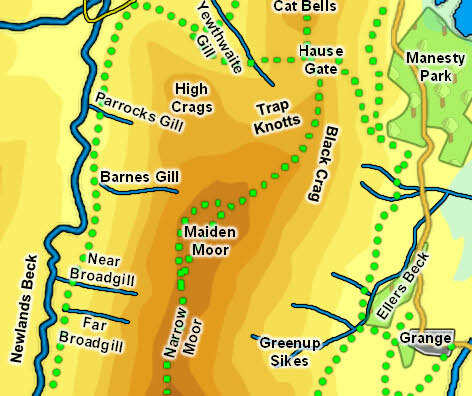 Barnes Gill and Parrocks Gill also flow from the western crags down into Newlands Beck. Maiden Moor has no tarns, but can claim a footing on Derwent Water. Like much of the Newlands Valley Maiden Moor had its own mines, in this case Yewthwaite Lead Mine at the north-western corner of the fell (although most of the mine is on the Cat Bells slope).